We are a small congregation with few staff- we rely heavily on volunteers to keep us running! See our Volunteer Page for more info. Our Annual Auction takes community donations of services and items and sells them to the highest bidder over the course of an exciting evening on the first Friday of December. Please encourage your friends and family to come out to this event to shop for unique holiday gifts! AUUF serves and sells Fair Trade Coffee and other products from Equal Exchange. Equal Exchange is a worker-owned cooperative that works with farmers all over the world providing a fair price for their products and promoting economic justice. Promote the work of Equal Exchange to provide fair prices to producers around the world. 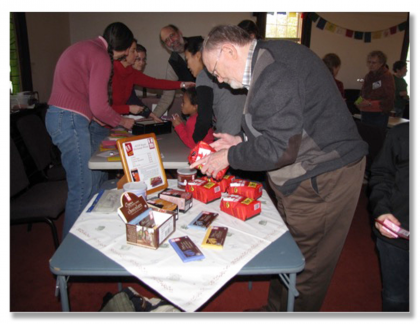 Promote the Unitarian Universalist Service Committee through the contributions Equal Exchange makes to the UUSC when we purchase products through their Faith Communities store. Promote stewardship of the AUUF through the profits from our sales that go into the AUUF operating budget. Please stop by our table after Sunday morning services to make your purchases. We sell Equal Exchange coffees, chocolate products, raisins and nuts. Amazon Smile donates a portion of your purchase price to AUUF! Go to smile.amazon.com/ch/63-6050908 whenever you buy from amazon! The item prices are identical.